Mike England has been flying hot air balloons with Hot Air Expeditions for 16 years. Imagine drifting smoothly and quietly through a clear blue sky, the cool breeze blowing wisps of hair across your face, gazing at the Earth from a wicker basket. That fantasy is a reality – every day, in fact – for hot air balloon pilot Mike England. England loves seeing thrilled, awe-struck passengers, whether it’s those who are afraid of heights or couples renewing their vows at a 7,000-foot elevation. What began as a hobby developed into a career when England moved to Arizona. Now, working for Phoenix-based Hot Air Expeditions, the largest hot-air balloon tour operation in the country, England has spent some 5,000 hours cruising through the air in balloons that can typically fit 250,000 basketballs. How does one “pick up” hot air ballooning? It started rather impulsively as a hobby. I had a friend whose brother-in-law flew hot air balloons, and he needed some land to take off from. I had the land, so I asked to go along for the ride. I bought his balloon when he sold it for a bigger one. Where did you store it? In my garage. It was just about the size of a small pickup truck, and the wicker basket was about 40×40 inches. Back then, I thought that was big. Size of balloons you’re flying now: Four times that size. The basket is 10 feet long and five feet wide, and holds 10 to 14 people. The balloon itself [called the envelope] is 250,000 cubic feet – meaning it can fit 250,000 basketballs. What does your job entail? I inflate the balloon with two other people using inflator bands and heat it with large propane burners. That brings the envelope up, and we fly through the air for an hour or so before landing and packing up the balloon. You deflate and re-inflate the balloons every day? Yes. Heat and sunlight deteriorate the fabric faster than anything else, so they’re stored inside. It takes about 10 to 15 minutes to inflate them again. 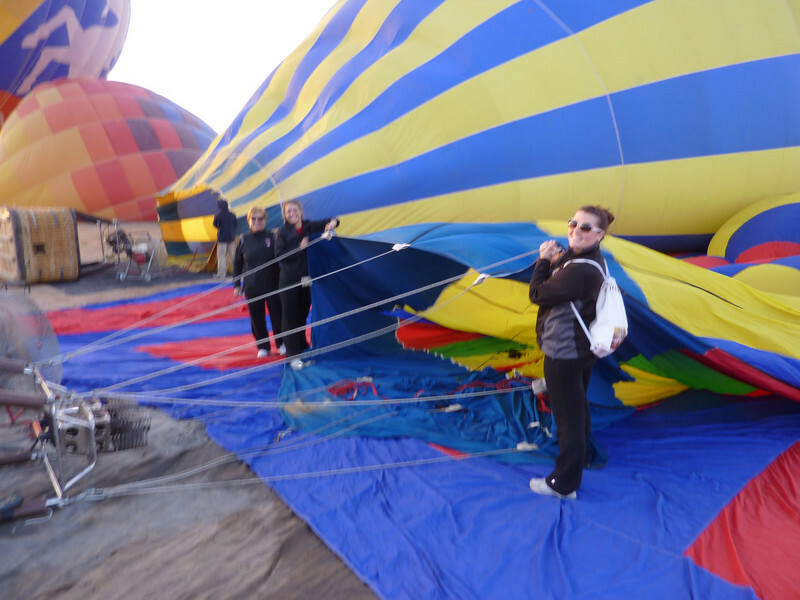 On my first (and only) hot air balloon ride, we landed with the basket on its side, and crawled out. Is that normal? Usually, we land with the basket upright and climb out over the side. If it’s windy, we’ll drag on the ground a little. If it’s very windy, we’ll land so the basket is on its side and then crawl out. What makes Hot Air Expeditions unique? At the landing site, we have a full breakfast [with the passengers on the balloon ride] with linens, china, and traditional champagne. We also have a ceremony at the landing site, where we present certificates as mementos and do the balloonist’s prayer. The balloonist’s prayer? It was supposedly started by an Irish priest years ago, when he found out how beautiful it was. The balloonist’s prayer, via BalloonFiesta.com: May the winds welcome you with softness. May the sun bless you with its warm hands. May you fly so high and so well that God joins you in laughter and sets you gently back into the loving arms of Mother Earth. How many flights have you piloted? About 5,000. What time of year is ideal for flights? Year-round, we do sunrise flights in the early morning. In addition, from the end of October until the end of March, we also do sunset flights. 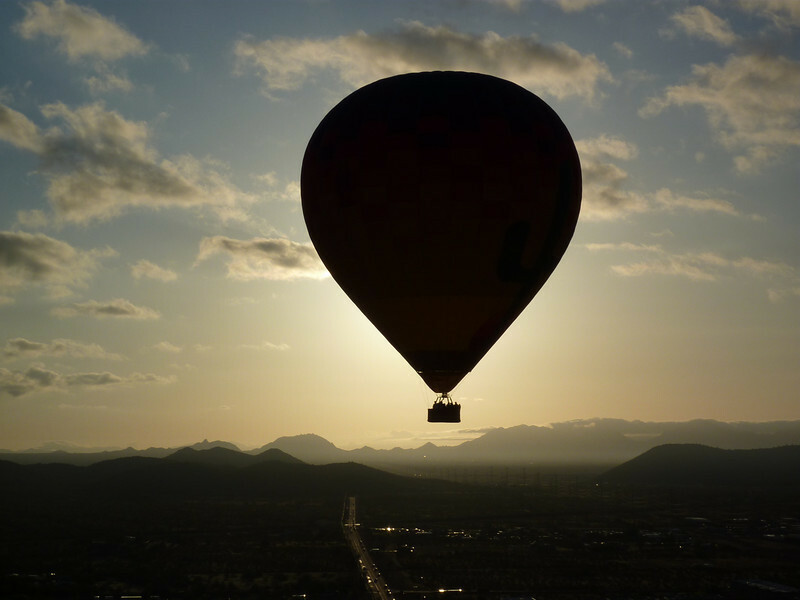 Something people don’t know about your job: We get quite a few people who say they’re scared of heights, but when in the balloon, they have no idea how high up they are. It’s like floating on air, something you’ve never experienced before. How high up do you go? It varies from several feet to 7,000 feet. The altitude is our steering wheel; we utilize the winds available to us to decide what’s a suitable landing site. What do you use to gauge winds? Weather forecasts. We also physically go outside in the morning and launch a helium balloon to see what happens. Typically, though, we have good weather in Arizona, so we don’t have to cancel many flights. Best part of your job: Seeing the happiness on passengers’ faces. We’ve done engagements and weddings flying over the most beautiful part of the Sonoran Desert. Most challenging part of your job: Mother Nature’s winds. Has anyone fallen out of the balloon while you’ve been piloting? No. Items you bring on each flight: An altimeter, a radio that communicates with a crew on the ground, a hat, and gloves for handling deflation ropes. Most memorable flight: A couple came out for their anniversary and was hoping to have someone who could renew their vows in the air. The qualified people they had found didn’t want to go in the balloon. 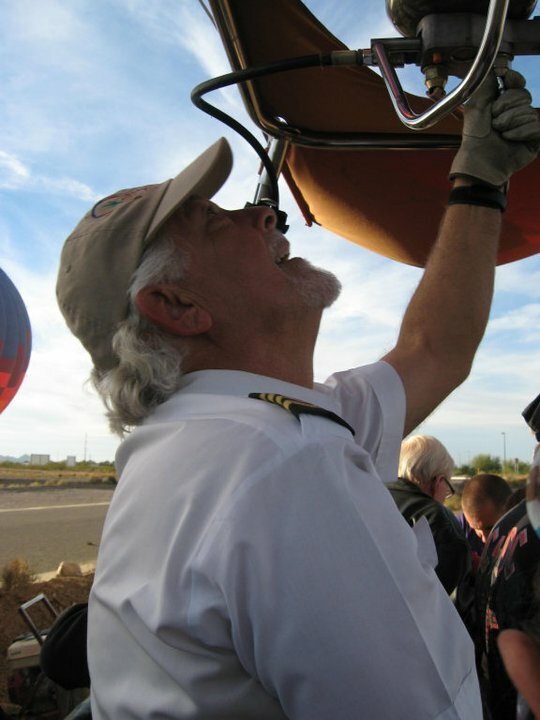 Then, as we were getting into the balloon, another passenger volunteered to do it – he was an ordained minister. That’s never happened before. Thoughts on Balloon Boy: That was a ridiculous situation. There was no chance that there was ever a person in that thing. If you actually saw the size of it, you knew it was clearly a hoax. What’s still on your bucket list? I haven’t skydived yet. Mike England discusses the highs and lows of flying. 1. It’s a very unique job, and only a handful of people fly large balloons throughout the country. Experience is key; fly with another qualified pilot who will give you the opportunity to learn. 2. The job is not one for the meek and unadventurous. It’s a challenging experience, and you must be willing to learn and want to give a great experience to other people. 3. Flying balloons is also physically challenging. You’re launching and deflating with a rope that you’re pulling in. 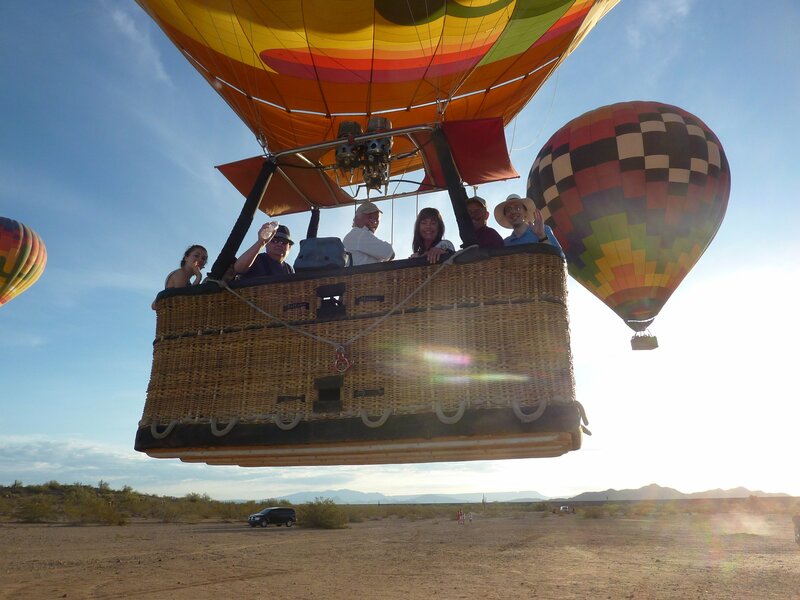 Check out Hot Air Expeditions on Twitter at @BalloonsAZ, its Facebook page, and its YouTube channel. All photos courtesy of Hot Air Expeditions. PLUS: For more in-the-air No Joe Schmos, check out the roller coaster engineer and the bull rider! This entry was posted in Cool jobs and tagged balloon boy, flying hot air balloons, hot air balloons, hot air expeditions, mike england by Megan Hess. Bookmark the permalink.